Be it a festival, or a Tuesday, Thursday, or Monday, we've all got reasons to be vegetarian, even if it's actually peer pressure. And it is a fitting opportunity to explore the city’s vegetarian foodscape. Believe us, when we say that you won’t be left hankering for options. South Indian meals served on banana leaves, homely Maharashtrian thalis, and fine-dine experiences that introduce you to organic cooking – it’s all available! 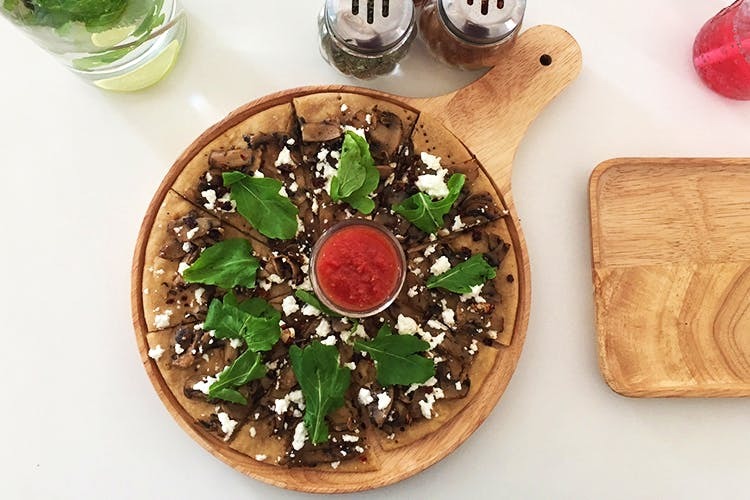 Without further ado, here's a list of the best vegetarian restaurants and cafes in Bangalore where you can graze greener pastures. Vegetarians looking to try Asian food without worrying about animal stock or fish sauce, this is where you need to head to. Part of our list on best vegetarian Asian restaurants, the place wins for vegetarian stir-fries, bowls, curries and hot pots along with a range of Vietnamese delicacies that includes coffee. Surrounded by potted plants and garden ponds, you can tuck into global treats at this quaint restaurant. Pizzas, burgers, sizzlers, and sandwiches are all part of the menu. You’ll find plenty of vegan and Jain options as well. And if you're not hungry, just enjoy some salad and glitter coffee! An all Indian menu awaits you at this charming cafe-restaurant. Drop by in the mornings for short eats, vadas, and cheelas paired with hot cups of chai. For a full-blown lunch, you can choose from pulavs, rotis and stuffed parathas that taste incredibly good with creamy curries. Read more about it here. Want vegetarian, but not necessarily Indian? Wood-fired pizzas, cheese-loaded lasagnas, and their long list of desserts are a must try at this all-vegetarian Italian restaurant. Burma Burma's vegetarian-only menu is worthy of trying for their entire menu is based on the South East Asian country's food culture. You've Samosa Soup, bowls of khao suey, and appetisers such as lotus stem fritters to dig into while you admire the Burma-inspired decor. Think finger puppets and lacquerware props. Also, the 12th Main restaurant takes their tea very seriously, and is an essential part of the cuisine here and acts as a perfect palate cleanser. As you take in the colourful, rustic setting, huge plates of Rajasthani food make their way to you. Try out traditional favourites like Dal Bati Churma, Jodhpuri Gatta, Rajasthani Bati, Rajwadi Kadhi, and Gunjiya. From the same peeps that gave us the Khandani Rajdhani thali restaurants come Rasovara, with a royal twist. Classics such as the Dhokla, Vada Pav, Chole Bhature, and Rajma Chawal are all spruced up and given a modern avatar here. Food done in Sattvic style is what’s on offer here. Their a la carte lineup features star dishes such as Lucknowi Jalebi Chaat, where the crunchy sweet treat is tossed with boiled potatoes, yoghurt and chaat masalas, Amritras Ke Kofte, balls of paneer doused in a spicy green peas masala, or the Gwar Patha Panchphoran, aloe vera tossed about in freshly ground spices and comes along with crispy greens. This place serves up some divine treats. Following the Sattvic principles of cooking, the menu here includes Indian, Continental, and Chinese contributions. Do try the Nellikai Charu, a soup made from gooseberries and the Raja Bhojanam, a dish infused with ghee and nuts – definitely fit for royalty. The Paan Ice Cream ends your meal on a high note. From ragi pizzas and momosas (yup, momos meet samosas), this vegetarian place is an absolute delight. Be it the Koramangala or Jayanagar outlet, you can find interesting versions of familiar food here. There’s even a ragi noodle pad thai if you fancy it. Drinks comprise healthy options like carrot juice or mint and spinach mixes, but it is the kombucha which we so love. This compact restaurant serves simple, South Indian vegetarian meals that pack a punch. Their weekend deluxe thalis include a selection of flavoursome curries, kootus (dishes made with vegetables and lentils), vadas, and payasam. Check out our love for the restaurant here.